Last edited by Mr. Vulcan on October 18th, 2012, 4:10 am, edited 2 times in total. The tools should work just fine for A1/A2 modding. To use in FleetOps, some setup may be required (nothing too hard). 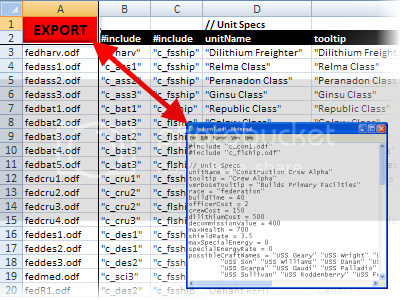 The tools allow you to enter all your ODFs and ODF commands into Excel, edit values directly or use formula to compute the various ODF specs, and batch export everything into your addon folder. A basic "import" functionality exists for reading in data from your existing ODFs. There are two Excel workbooks in the download and a documentation file. This is the initial release, so bugs are to be expected. You can always catch me here on the forums for any bug reports or feature requests. - No need to set up all column headings (commands). Extra commands will be appended at the end of the second row. these sound good would you mind if we tweak these to be more usefull for fo? Blade wrote: these sound good would you mind if we tweak these to be more usefull for fo? 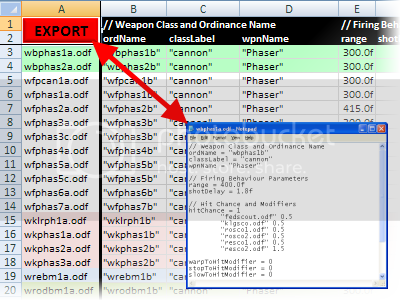 - Import ordnance ODFs along with weapon ODFs with no extra set up.